The TARDIS controls are broken and the Doctor doesn’t know if even the TARDIS can survive being immersed in lava, so he very reluctantly activates an emergency device that even he’s not sure what it will do. Zoe notices that there’s now nothing appearing through the TARDIS’s monitor, to which the Doctor grimly replies that they’re nowhere. At Zoe’s persistent prompting, the Doctor admits there is something out there, but it’s an unknown dimension outside the universe, and warns that they shouldn’t even consider exploring. However, Jamie and Zoe both become convinced that they see glimpses of their homes through the monitor. Zoe steps out and vanishes, with Jamie following behind her. The Doctor stays behind, sensing a hostile consciousness, and focuses on it telepathically. However, the consciousness pressures the Doctor to leave the TARDIS when Jamie and Zoe are threatened by robots. The Doctor thinks he’s rescued his companions and escaped in the TARDIS, but suddenly it appears that the TARDIS has fallen apart and Jamie and Zoe are stuck clinging to the console as it floats in a void. Lost in a forest, the Doctor comes across an Englishman in 18th century clothing, who tells the Doctor that he is accused of treason by “the master” (but not that Master) before disappearing. Next a group of children in Victorian garb accost the Doctor and barrage him with riddles before threatening him with a sword and demanding that he “rearrange.” The Doctor realizes that they’re speaking of anagrams and makes the word “words,” which changes the sword into a dictionary. The children are pleased and tell him that he may be suitable before running off. Next the Doctor comes across a pictograph puzzle that challenges him to put the correct parts of a face on a frozen and faceless Jamie, but the Doctor messes up and gives Jamie the wrong face, giving the Doctor the “wrong” Jamie, although this Jamie remembers everything that’s happened. Together they save Zoe, again using word play. Climbing up one of the “trees,” Jamie notices all the trees in the forest are letters and spell out cliched proverbs. The three are soon captured by toy soldiers, who bring them to a clearing where they’re attacked by a unicorn, but the Doctor causes the unicorn to disappear by challenging his companions to deny its existence. The Doctor suspects they’re being tested by this “master” character. Jamie gets frozen and loses his face again, but this time the Doctor gets the puzzle right. The trio stumble across a cavernous maze, with only a ball of thread to keep them from getting lost. In the middle of the maze they come across the Minotaur. Again, though, Zoe and the Doctor dispel it by denying its existence. While looking for Jamie, who was lost in the maze, the Doctor and Zoe comes across the 18th century man again. The Doctor figures out that the man is the titular Gulliver from Gulliver’s Travels, and that he can only speak the dialogue from the book. From Gulliver, the Doctor learns that the master of the land resides in a citadel. Meanwhile Jamie, eluding the toy soldiers, climbs a mountain using a “rope” that turns out to be Rapunzel’s hair. Jamie finds that “Rapunzel’s tower” is actually the Citadel, a hi-tech repository for fiction, along with a ticker that reads out the current adventures of the Doctor and Zoe, through which he learns that the two are facing Medusa. The story told by the ticker ends when the Doctor uses a mirror to defeat Medusa, rather than the sword like the story anticipated. Outside the caverns on their way to the Citadel, the Doctor and Zoe are confronted by the Karkus, a superhero from the 21st century. Zoe manages to get the Karkus on their side by defeating him with judo. Reunited with Jamie in the Citadel, the Doctor and Jamie compare notes, and the Doctor guesses that if he had followed the confrontation with Medusa as anticipated he and Zoe would have become fictional beings. Robots then force the Doctor and the companions into the master’s chamber. It turns out that the dread master was a late nineteenth century writer of adventure stories for a boys’ magazine, who was abducted and hooked up to a central computer in order to run the “Land of Fiction.” The master is getting old, and the computer wants an immortal replacement: the Doctor. I’ve complained about how the show has lost the sense of “anything can happen!” that prevailed during the First Doctor era, and this episode is definitely a delightful callback to that time in the show’s history. 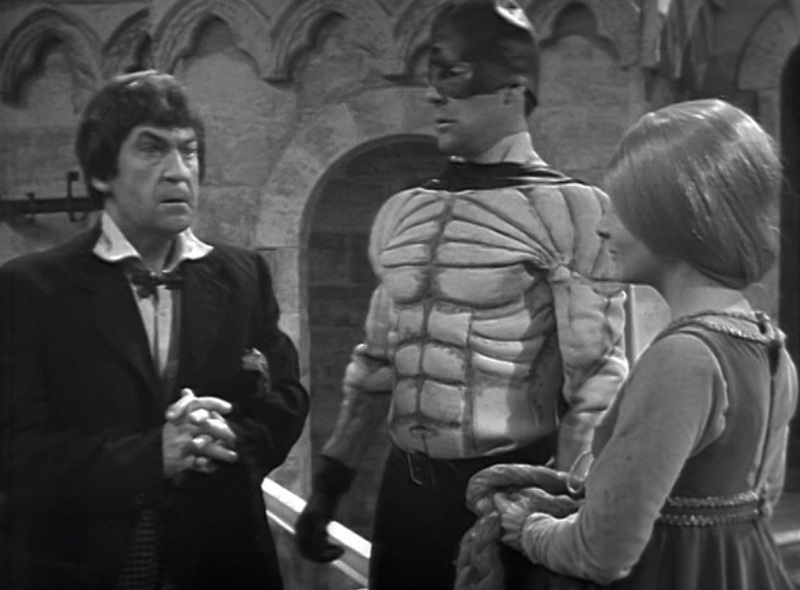 As classic as it is, the Second Doctor era often tapped into a pretty rigid formula, so an adventure like this is much welcome. Even without that context, though, this is a strong serial in its own right, and usually gets included in “Best of Classic Doctor Who” lists. The BBC also included it as the sole representative of the Second Doctor era in its Classic Doctor Who collection, currently on Netflix. It’s not hard to see why. It’s a briskly told story even across five episodes with some nice surrealness thrown in. Even the necessity of explaining away why there’s a replacement for Frazer Hines as Jaime because he became ill is made a natural if very weird part of the story. For all that, it didn’t actually get a positive reception when it was first broadcast probably explaining why we didn’t get many more stories like this one through the rest of the classic era. However, it’s definitely become vindicated over time, with genuine bizarre and creepy moments, with a dash of postmodernism. Let’s face it, MacGyver is the Batman of network TV. After all, Batman may be a charter member of the Justice League, but MacGyver was in the 1988 incarnation of the League of Extraordinary Gentlemen. I’m not kidding. Like Batman, MacGyver doesn’t use guns (except very early on…just like Batman! 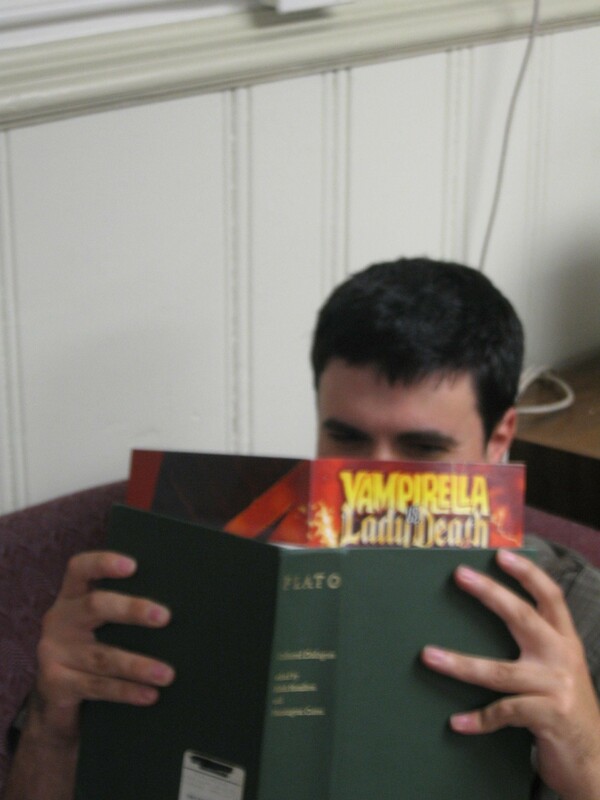 ), relies on his wits and brawn, and has almost superhuman ingenuity. What you might not know, however, is that, also like Batman, MacGyver had jaunts through time. He had been in the Old West not once, but twice, in “Serenity” and “MacGyver’s Women.” For our case study today, MacGyver goes back a tad further, to Camelot! Pete, MaGyver’s boss, has arranged for him to meet a high-profile genealogist for research into his own family background. The genealogist is only able to trace the MacGyver name back to the eighteenth century, but suspects that the MacGyvers might be an offshoot of an older family, the similarly named MacIvers, who can be traced all the way back to the seventh century to a man named “Ian MacIver.” MacGyver learns that Ian MacIver died in prison, wrongfully accused. If you”re familiar with early medieval history and this seems like an amazing amount of detail gleamed from the records typical of the time, well, you might as well conserve your “History Nitpicker” points now! MacGyver’s trip back to the past is very uncomfortable. Outside the genealogist’s office, he saves a soon-to-be-married groom from a falling window box, but takes the “bullet” himself. Knocked unconscious, MacGyver somehow wakes up in Camelot. 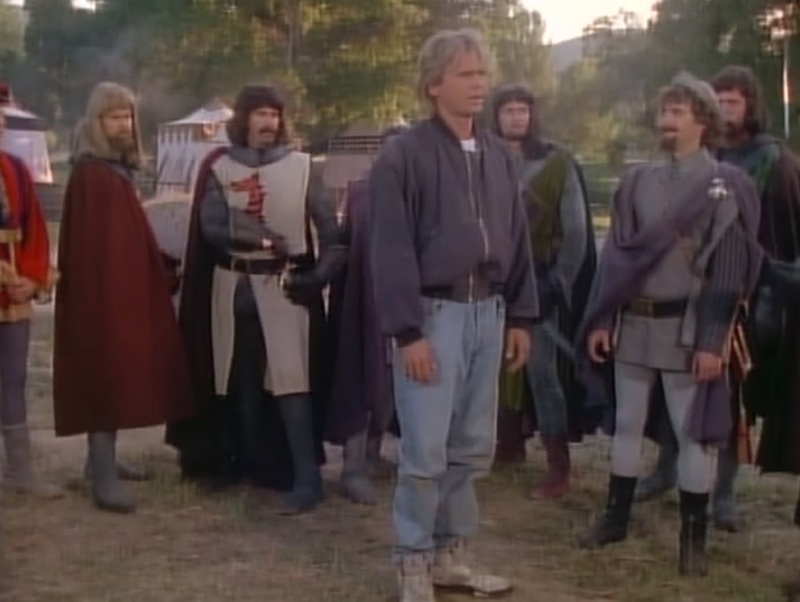 I know what you’re thinking; dammit, MacGyver writers, the Middle Ages does not equal King Arthur! But at least they did establish that this would be the seventh century, and most theories about a historical King Arthur do put him somewhen in the fifth and sixth centuries, so…close enough! At least MacGyver seems to care about messing up history, sort of. His presence interrupts a joust between Galahad and another Knight of the Round Table, the legendary Duncan. MacGyver intervenes and volunteers to fight not just because he’s a nice guy, but also because, as he shouts, “You can’t kill Galahad! It will screw up history!” This is, MacGyver says, since Galahad is supposed to go search for the Holy Grail. And MacGyver should know, since, yes, he tried to find the Holy Grail himself! Anyway, while everyone of course scoffs as MacGyver for refusing to use a real weapon, he still manages to dismount Duncan using a lasso. This kind of misses the whole point of the joust since it’s supposed to be a way to train knights for mounted combat, but jousts aren’t supposed to be happening this early in history anyway, and…wait, why are we worried about historical accuracy in an episode of “MacGyver” involving Arthurian myths again? What’s wrong with you people? To be honest, laughing about the bizarre and obvious historical inaccuracies is one of the few things interesting about the first part of this two-parter. 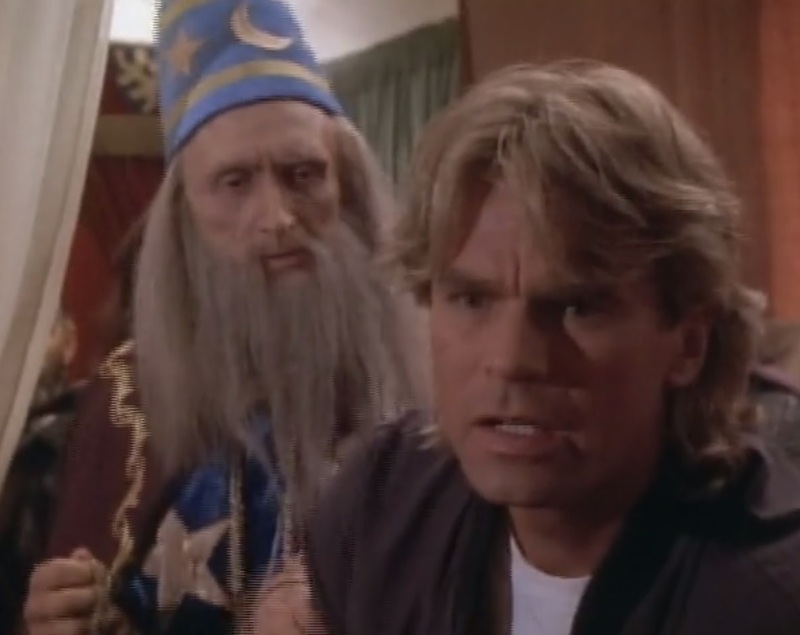 The plot tries to set up a mystery when Merlin sees MacGyver as a rival and King Arthur, who happens to look like Pete, is poisoned, but Duncan is so assholish that it’s pretty clear he’s hiding…well, everything. But it is funny seeing Merlin being dickish to MacGyer. And you can’t blame Merlin, since MacGyver shows him up with a Swiss army knife and a lit match. Yes, this Merlin is no Sam Neill; he’s not even the Merlin from Merlin’s Shop of Mystical Wonders. Things do pick up when Duncan dies (falling into a pit of lava, no less!) and Arthur sends Merlin and MacGyver to fight Morgan Le Fay (called Mograna here), who happens to have allegedly taken Ian MacGyver as her accomplice. Morgana Le Fay happens to have taken over Scotland (here called Caledonia), which is from Camelot just a short trek through a cave (although to be fair one of the theories about the historical King Arthur is that he was a king or at least a warlord in Strathclyde, which is now part of southern Scotland, so…okay, I’ll stop putting way too much thought into this). 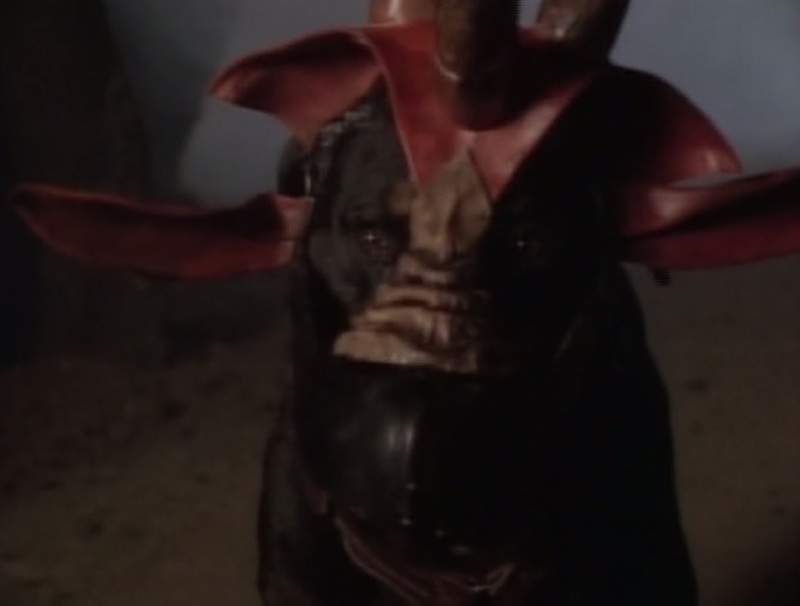 Besides having enough lava for a Super Mario Bros. castle, the cave is also guarded by this fearsome hellhound. Funnily enough, everyone acknowledges it’s just a dog in a goofy mask, with even Morgana taking it off at one point and MacGyver being able to dispatch it with just a makeshift dog whistle. This leads me into the saving grace of this saga. It’s strongly but still subtly implied that the tale’s sorcerers aren’t really magic-users as we might think, but just people with a basic understanding of engineering and science and a lot of ingenuity – like MacGyver himself. I might be off-base – the lack of magic just might have been caused by a lack of a special effects budget – but if I’m right that’s actually pretty clever. But it doesn’t stop Merlin from bemoaning that he’s lost much of his magical ability, although he might not strictly be talking about magic when he complains, “Things don’t work like they used to. 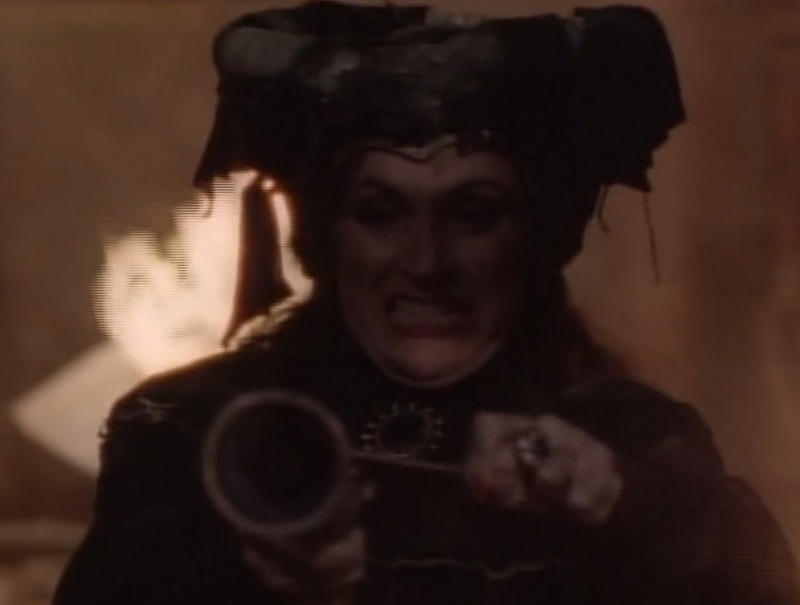 Sometimes not at all.” As much fun as the Merlin-MacGyver “rivalry” is, though, the real star is Morgana Le Fay, played by Robin Strasser, who made trash culture glory with her portrayal of Dr. Dorian Lord, one of the great alpha women of American daytime television. In true villain fashion, Morgana has two bungling henchmen (which I guess is explained by the fact that seventh century Scotland appears as sparsely populated as western Kansas) , and of course she punishes one of them for his failure by killing him using her dreaded new weapon: gunpowder! Morgana hopes to conquer all of Britain and then all of western Europe (and maybe…the world!) using the new technology. Basically, she wants to keep western Europe unified and prevent the so-called “Dark Ages.” Who exactly are we supposed to be rooting for here? Meanwhile MacGyver rescues Cecilia, Galahad’s fiancee who was being held prisoner by Morgana because…I don’t know, the plot said so. Also he finds the dying Ian MacGyver, who directs him toward a hidden message etched on the cell wall that MacGyver uncovers using his own brand of sorcery that clears Ian’s name from ever being a willing accomplice of Morgana. Morgana imprisons them, but they’re able to escape and blow up Morgana’s lab using the ol’ Ben Franklin kite trick and two extremely conveniently timed lightning bolts. 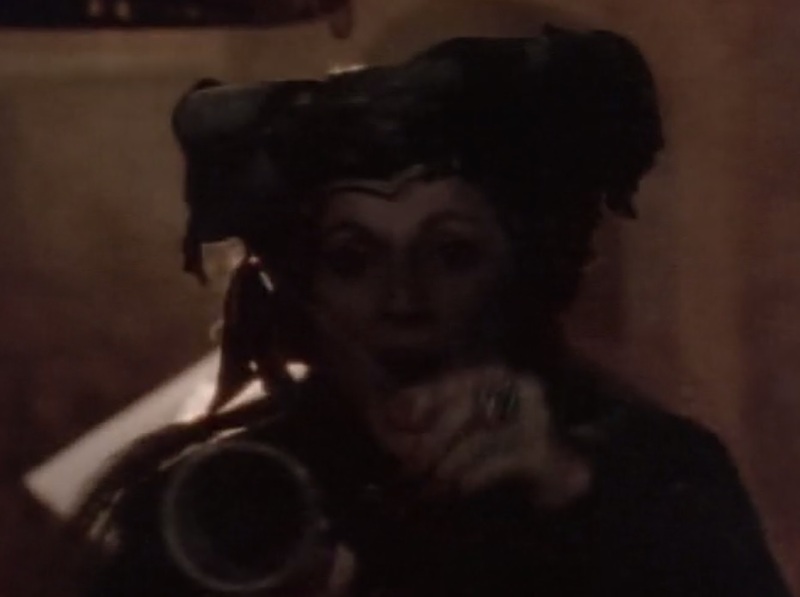 But for me this is all just a set-up for what is, to me, a moment that became a classic the microsecond it was broadcast: Morgana Le Fay dramatically screams “MACGYVER!!!! !” before blowing him away with a makeshift gun. Aah, that’s the kind of thing that makes it all worthwhile. As you might expect, MacGyver wakes up in the present and has a “You were there! And you were there! And you were there!” moment when he sees that the groom he rescued looks like Galahad, the bride-to-be looks like Cecilia, and the EMT tending to MacGyver’s head injury is Merlin, armed with the Swiss army knife MacGyver gave him. I half-expected Morgana to show up as a bitter soon-to-be mother-in-law, but alas. As more proof, though, MacGyvver finds that he still has an amulet that King Arthur gave him. So there you go…concussions just make MacGyver travel through time. Top that, Batman! It’s the sort of saga that just wouldn’t get done today unless it was written with an insufferably self-aware postmodern, deconstructive, hyper-ironic sensibility (well, thanks in part to assholes like me). 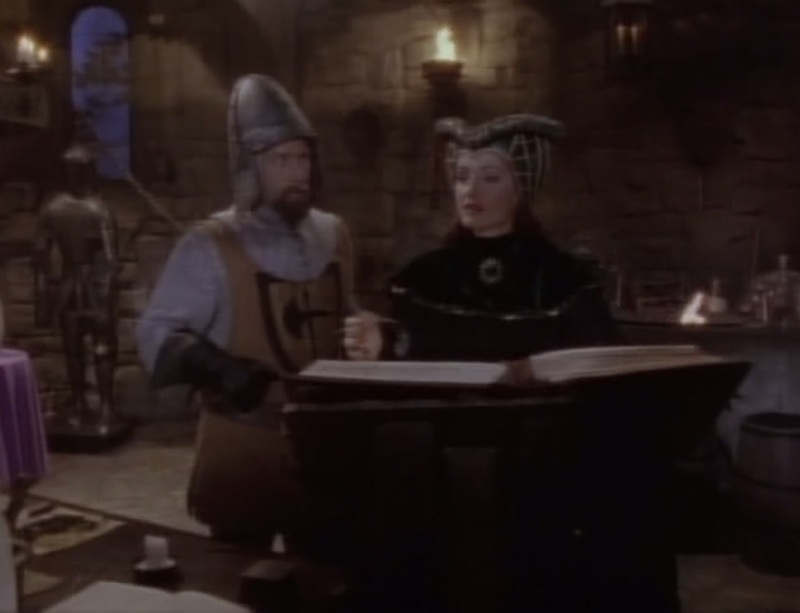 That’s a shame, because as goofy as it is, it is pretty fun, at least when they dispense with the predictable who-dunnit and get straight to a bickering MacGyver and Merlin stopping Morgan Le Fay from conquering Europe with gunpowder. You really have to be a snob with a heart of stone not to see the pure joy in a story that has King Arthur declare, “The magic of Merlin combined with the magic of MacGyver may be the force that is required to bring Morgana to her knees!” It’s a thing of beauty.